If you have access to a high-speed wireless Internet connection (WIFI), you may choose to access your course using a standard web browser. We recommend that you use either Google Chrome or Firefox for best performance. Since this is a browser-based approach, it will typically work effectively on desktop, laptop, tablet and smart phone platforms. 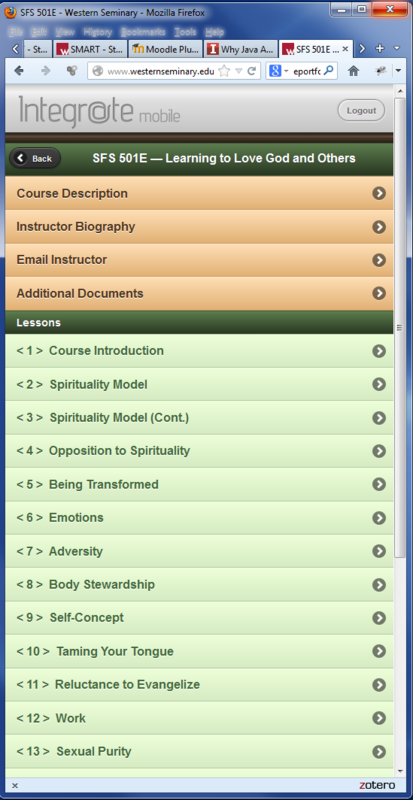 After a simple login, you are able to view course media for the course you choose. We do not recommend, however, that tablet or smart phone uses stream course content using their mobile data plans. The files are simply too large and will consume most plans quickly. To access your course online through your browser, please click on the link below. Most laptop and desktop computers now include one or more large (750 GB - 1 TB) disk drives that allow users to download and store large amounts of content locally. Once downloaded from the web, content becomes available universally without concern for an Internet connection. For this purpose, Western Seminary students download their courses into our propriety content and resource delivery platform, Integr@te. This system permits you to view course media anytime and anywhere. And you can copy your course to disk and keep it as a lifelong learning resource. The program also tracks your progress to help you know what you watched and how far along you are in your course. How big is the course download? Pretty big. But don't let that be of great concern. 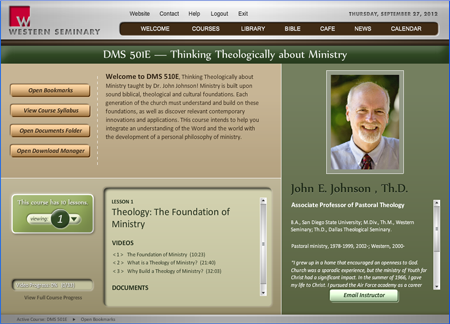 Each semester hundreds of our students successfully download multiple courses to their computers for anytime viewing. For your guidance we have included total download sizes for each course in the chart below. Integr@te's download manager allows you to download courses all at once or piece by piece, with all the activity taking place in the background. After you successfully download your first media component, you can start watching while your course continues to download. To use the Integr@te course delivery platform, you must first download two small programs: Adobe Air and, the program itself, Integr@te. For complete instructions please follow the link below. Once you are registered to access the course materials, you can use Integrate when you are on your desktop or laptop, and Integr@te Mobile when you are using your tablet or smart phone. The same username and password works for both platforms. * Note: Mentors who choose the online course option will not be registered as an audit student for that course and no record will appear on a student transcript. If you desire or require audit status, you must enroll in a campus course. Choose your course from the above list. Complete the following form and submit it for verification of your mentor benefit status and to select the course of your choice. You will receive confirmation by email of your selection, along with your login information. If you plan on using Integr@te to download your course, you may download and install the two required files at any time. You will not, however, be able to access your course until you receive your username and password. If you have any questions regarding the involved systems and technologies, please email James Stewart or call him at 503-517-1898.